Matthew Quick is foremost known as the author of The Silver Linings Playbook (as mentioned on the cover for Every Exquisite Thing), which was adapted for the big screen and starred Bradley Cooper and Jennifer Lawrence in the leads. But my first encounter with his written work didn't come until I read the incredible Forgive Me, Leonard Peacock back in early 2014. An intelligent, poignant, witty, provocative and deeply touching novel, it solidified Matthew straight on my must-buy list. Nanette O'Hare's world turns upside down when a teacher gives her a copy of cult classic The Bubblegum Reaper. The story of Wrigley resonates with her like nothing else has during the 18 years she has been alive and so she obsessively rereads the novel, taking in every detail and trying to understand the meaning of the turtle in the pond, Unproductive Ted, and which of the twin girls in his class Wrigley had a rare connection with. The Bubblegum Reaper has been Nigel Booker's only published work, and even that went out of print soon after publication, adding to the air of mystery surrounding the author. So when Nanette gets the opportunity to meet Booker it feels like a dream has come true. He shows her that she is not alone; there are other people out there who obsess about Wrigley and Unproductive Ted, though for some the intensity with which they connect with the novel might be too much to handle. What I love most about Matthew Quick's novels is that each one is completely different, and so whenever a new book by his hand is published the contents are going to be a surprise to the reader. He's unpredictable, and so are his characters, which makes getting to know them a hugely exciting experience. One thing all his books do have in common is that they provide an insight into the complexity of the human mind, never more so as in the very meta Every Exquisite Thing which analyses a fictional coming of age novel within another fictional coming of age novel. Nanette is balancing on the cusp of adulthood, trying to understand herself and the world from a perspective that isn't quite childish naivety but it isn't very worldly yet either. With Wrigley, Booker and new friends guiding her in different directions, ultimately it's up to Nanette to carve out a path for herself that is right for her and leads her onto a journey of happiness rather than destructiveness. It isn't always easy, especially when she comes to realise that the adults are struggling just as much with identity and acceptance as the more inexperienced teenagers surrounding her and life is a constant learning curve regardless of age. The Bubblegum Reaper makes Nannette think and as a result Every Exquisite Thing has the same affect on its readers. It's as much a fictional novel with made up characters as it is an insightful examination of growing up and making sense of the world. 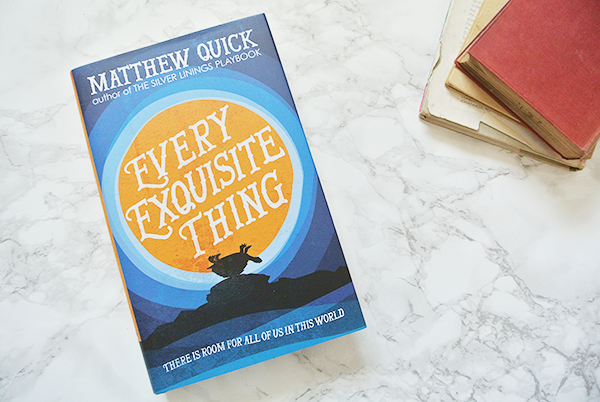 Matthew Quick isn't only an exemplary storyteller when it comes to imaginative concepts but he also makes you question established perceptions, ensuring that his clever words stay with you long after turning the final page. Every Exquisite Thing is published by Headline and you can buy the novel from Foyles or your own preferred retailer.